I am at least the fifth owner of this bike and during the past 52 years it has seen many places and wonderful stories must be embedded within its frame. This is how the bike looked when I became its latest owner in June, 2009 after espying it hung up on a garage wall looking magnificent. I asked the seller to give me some of its history and this is its, and his, story.
" I purchased it for my son in 1983.It had formerly been used a s a commuter bike for some years, and now stood, covered in dust, sad and neglected in a garage. A sight to tug the heartstrings of any enthusiast. With worn and flat tyres, worn out rusty chain and brakes, it had not been cared for or appreciated for a number of years. I think the man said it had belonged to his son originally before he had began using it as a commuter bike to the local Rolls -Royce factories in Derby. But under the dust, the purple frame was as good as ever, a testimony to Reynolds 521 steel. I think I paid £48 for it, more to save the bike than to please the old owner. After a spruce up with new tyres, tubes, chain and brakes it was presented to my own son who rode it for a few yers until he went off to university. The bike was then not used greatly unless he was at home during the vacations. After he left university the bike remained with me and I decided to sort out the whole bike from the frame up. Many things had now worn further including the headset which was very badly worn; so much so that I had to have the tubes interior rebuilt up by welding and then re-bored to take a new headset. To replace it I chose a taper roller headset normally used on cross country bikes. It should not need to be ever adjusted again. The frame was stripped of the old paint, trued up and resprayed and then a chrome finish was added to the wheel drop outs and the frame above for about 18 inches. The original frame had this chrome finish too. I splashed out on two new 27 inch wheels hand built by Mercian. A new Campagnola seat tube plus new bars and head tube completed the rebuild. The bike was then used for summer rides, I could not bear to take it out in the winter salt! Most of the rides were around 60km or with the local CTC group. At some point, about 10 years ago, I was knocked off the bike by a motorist who ignored the stop sign at a set of crossroads. He collided with the back wheel and sent me flying - result - a buckled back wheel and a return trip to Mercians to get the frame checked. No problems on the frame and with the wheel rebuilt onto the same hub all was well. However, as I now owned 5 bikes the Mercian got very little use., and, as I recognized a growing fanaticism in a friend, ( ME !!! ) I sold it to him to fan the flames. Little did I know the roaring fire that it would produce!! " And how right he was! The group set has gone through many variations, from a compact 48/36 Stronglight when my friend acquired it, to a Campagnola 52/42/30 during his period of ownership to its current evolution with a Stronglight 46/36/26 triple as I prepare for the advancing years and try to learn some bike maintenance skills. I originally intended to try and restore it to the condition when it was first built, but a lack of knowledge, coupled with the fact it was probably a high geared racing machine, deterred me. There have been other changes which might form the topic of a further post but now it is back in regular use as a winter bike with 63*32 Schwalbe Marathon tyres ( the only tyres I can get to fit these wheels ). 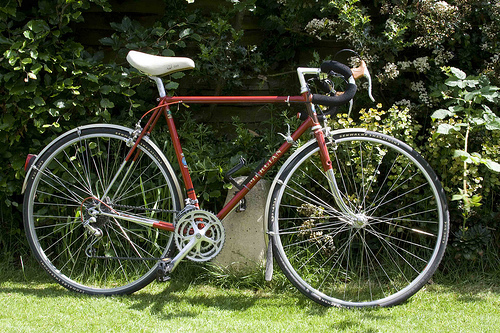 My new Mercian Vincitore Special has become my summer bike and it too has already started to evolve. Good work. Looking at the photo now it seems there are too many spokes in those wheels. How fashions change. Looking at the text I wish I had emphasised that Mercian's did the whole of the frame renovation, and they did a cracking job. However, it all reminds me of summers the like of which I now feel we will never see the like of again. The last one was during the marriage of Princess Dianna, a very hot day when Gareth and myself rode into the peak, the Mercian and the Motobecane out again, we were out the whole day so I don't know how far we rode. I did not see the wedding but I know it was so hot that my wife and daughter lay with their bodies out side the patio doors and their heads inside the house watching the telly. Memories come back in short bursts. But happy days.